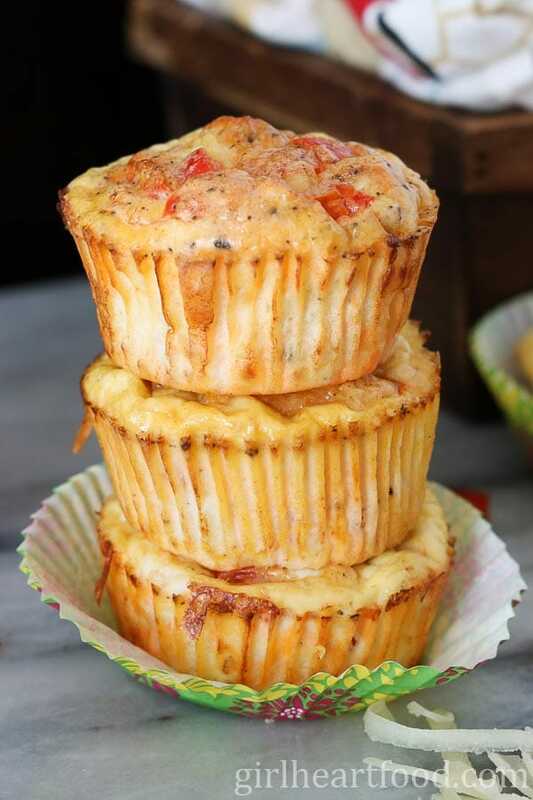 Breakfast Ham and Egg Muffins – These are easy to prepare and perfect for busy mornings when you just want to grab and go (with coffee, of course). 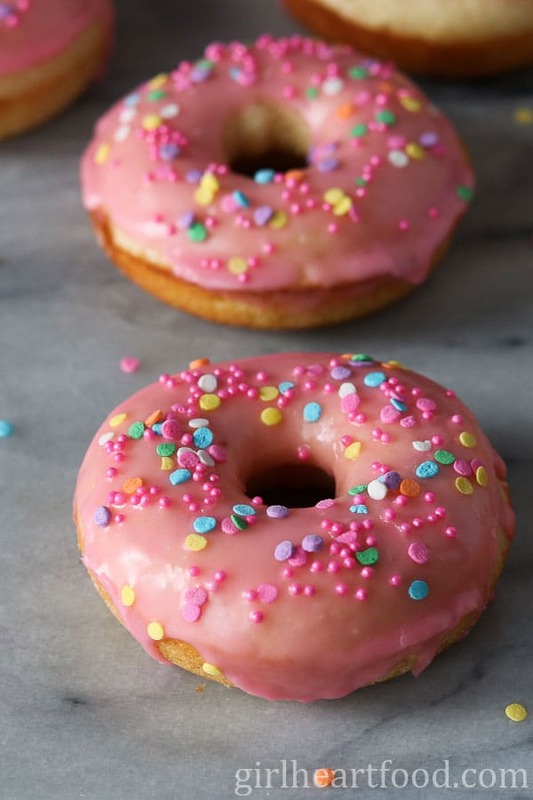 Vanilla Glazed Baked Donuts – Easy homemade baked donuts with a pretty pink glaze. You can probably have these made faster than going to your favourite coffee shop! 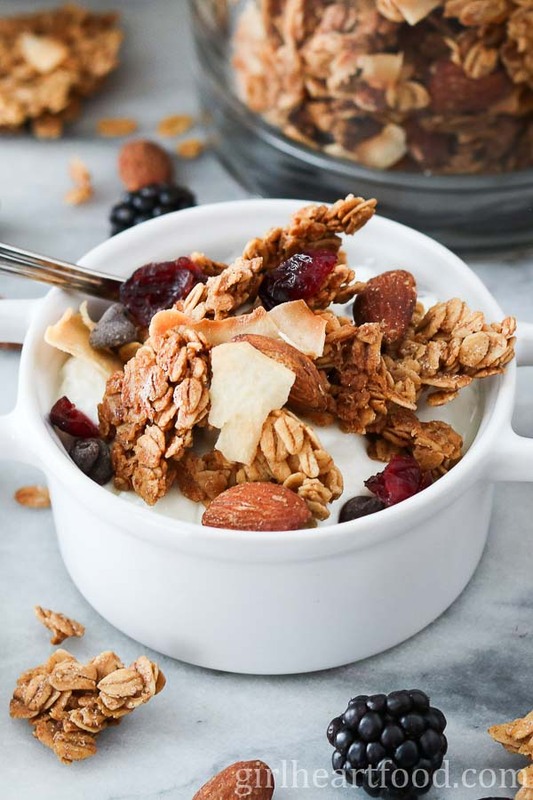 Homemade Granola – Delicious with milk, yogurt or eating by the handful! St. Patrick’s Day Recipe Round-up – A bunch of comforting recipes from myself and fellow friends and food bloggers. These are meant for St. Patrick’s Day celebrations, but honestly good for anytime! Simply Citrus Book Review + Citrus Hummus Recipe – A review of a citrus inspired recipe book, plus one unique hummus infused with lots of citrus flavour. Three Bean Chili – Whether you’re a vegetarian, vegan or meat lover this hearty chili is sure to satisfy the ol’ taste buds. 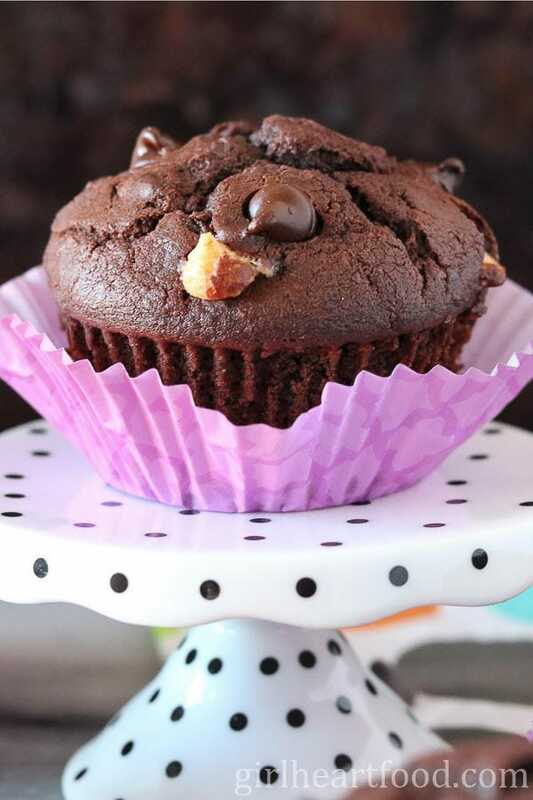 Triple Chocolate Muffins – These are loaded with cocoa powder and milk and white chocolate chips. All you need is a tall glass of milk to go with! Lemon Poppy Seed Overnight Oats from the lovely Katherine from Love In My Oven – Lemon poppy seed bread is waaaaay up there being a favourite of mine so I can only imagine how lovely it is in oat form. Ugly Delicious on Netflix with David Chang where he talks pizza, tacos, chicken and more. Be prepared to get hungry! I even learned the history behind ‘hot chicken’ (it’s quite funny). Basically, a lady tried to get revenge on her significant other for coming home late by preparing some really spicy chicken. Guess what? He loved it and the rest is history! On that note, have you tried hot chicken? It’s chicken that’s fried until golden brown and crispy and then brushed with hot oil infused with cayenne. Typically it’s served with white bread and pickle. P.S. It’s AWESOME! Tomb Raider movie starring Alicia Vikander. This is an action movie based on the video game. I really enjoyed this one and was constantly mumbling to myself througout ‘you GO girl’. I may have been a little vocal, but it was just too good! Hubby and I regularly listening to Spotify on the weekend. While we’re cooking something up on Friday or Saturday night (usually Saturday cause Friday is pizza delivery night, lol), we check out some new music. I recently discovered French singer, Charles Aznavour. I LOVE his music. I particularly enjoy the song titled ‘She’. If you’re looking for something a little different, check this guy out! P.S. —>if anyone knows how to transfer music over from an iPhone to a Samsung, help a girl out! If you are looking for something a little ‘Eastery’ for this weekend, check out my mini egg bundt cake recipe. And if you find yourself wanting to get all nostalgic and dye a few eggs for an Easter hunt, check out this natural way to do it. Also, I think I need popcorn slippers. I came across them the other day. Let me set the scene here—>Wine. These. Netflix. Popcorn. YES! Have a wonderful weekend, you guys! What a lot of deliciousness was happening in your kitchen, Dawn! I haven’t tried hot chicken ever – loving that cayenne coating on it! 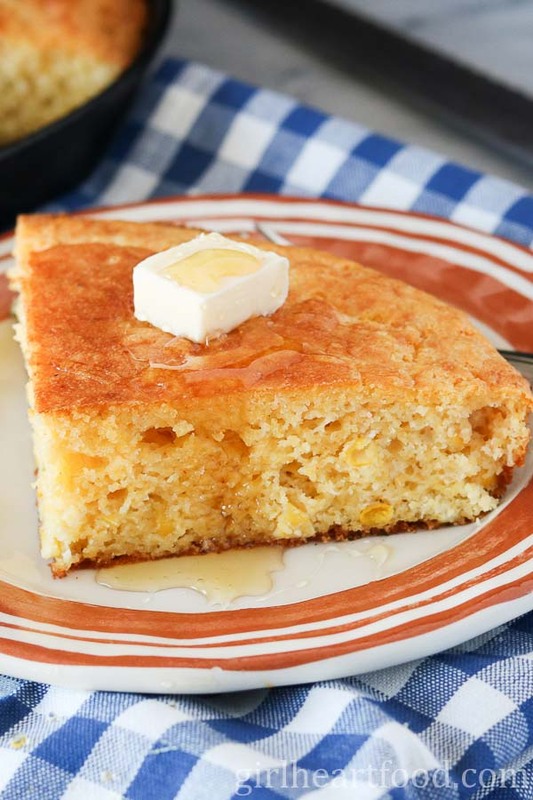 BTW – thanks for including my recipe in your round up – and I saw your comment about This Is Us on my post and lady, I LOVE LOVE LOVE that show! IMO the first season was so so good – but the second was pretty good too – left me wondering wfrom whose eyes is this story being told really? I wasn’t able to stomach too many episodes of Santa Clarita Diet – even though the characters (especially the dad) were so likeable but I managed to get my daughter to watch Marvel’s Agents of Shield with me – it’s one of my fav shows eva! Happy Wednesday, friend! These round ups always make me hungry AND get me excited about new music and movies! So… March was a pretty tasty month, wasn’t it? You’ve got some wonderful stuff here. Those donuts look absolutely amazing! I’ve never tried my hand at homemade donuts, but if you can get results like that from a baked donut, I’m tempted to give it a go. Love that you picked the citrus hummus from Simply Citrus too – it’s a great book with so much to work from. Can’t wait to see what April holds in store. Cheers! Totally 😉 I can’t believe how easy those baked donuts are….almost too easy, lol. Thanks Sean! I think it’s safe to say lemon poppy seed overnight oats sound like THE BEST BREAKFAST EVER! I love lemon poppy seed bread and muffins but I haven’t heard of anyone putting the flavor combo in overnight oats. GENIUS! Right?! Haha – I do need them in my life 😉 Thanks Christina! Happy weekend! So many tasty goodies this month. I’m still drooling over those Homer Simpson donuts. 🙂 Happy long weekend, Dawn! I cannot believe March is going and April is coming. That means I’ll get back to my love pretty soon 🙂 . Your March recipes are one more delicious than the other, I am a chocolate lover so my favorite is the triple chocolate muffin, yum! I better persuade Loreto to get Netflix, too many good shows we are missing. Happy Easter, Dawn, have an incredible weekend! What a lovely collection of all your favorites and readers favorites from the blog. I am going to try few from here, especially that granola! Thank you Sonal 🙂 Enjoy! I can see why these are your favorites! They all look good. Fabulous round up Dawn! Those homemade granola were soooo good! And that hummus yummmm! Thank you so much, Beth 🙂 !! Happy weekend! I can’t believe we are days away from April! Totally happy the winter is over, but time could slow down a bit. I already have a hard enough time finding enough hours in the day! This is another great round up Dawn. Those chocolate muffins are just calling my name! Happy Easter! Thanks for the shout out on the oats!! Girl, weren’t we just saying HOW is it Christmas already? Time is blowing my mind lately. April cannot be here! I have too much stuff to get done in March! Anyway. . .those slippers! Yes to wearing popcorn on my feet :). Happy Easter, Dawn! And another month just flew by! Meatless or not:) I am in dire need of your pink glazed donuts today. Sick boy at home and so foggy outside cannot see the neighbor’s house, just the blurry outline of their fence.. Perhaps I should just slip on those popcorn slippers and get cooking:) Happy Easter weekend, Dawn! Another fabulous round up Dawn! That chocolate muffin! I’m still drooling over it all! Thanks Kathy! Haha…wouldn’t that be funny! !